Head High Heart Strong: The Colors of Korea: Pink! The Colors of Korea: Pink! I mentioned last week that I was taking part in a project which celebrates how colourful Korea is. Mimsie from Seoul Searching got a group of bloggers together, told us all to pick one colour, and explore what the colour symbolises in Korea. I decided to go with pink. Since I agreed to do this project, I've been noticing pink everywhere. One thing that I really started to consider was how 'cuteness' is really valued in Korea. In some cultures it's good for girls to have manly traits, in others it's important for them to be outspoken, independent, homely or wise, but in Korea I think there is a particular emphasis on beauty and cuteness. I also see this reflected in the guys too, who are all very well maintained and wear cute slogans across their tshirts and cartoon style hats, so it's no wonder that pink is a popular colour here. But there is more depth to pink in Korea, here is what I found. 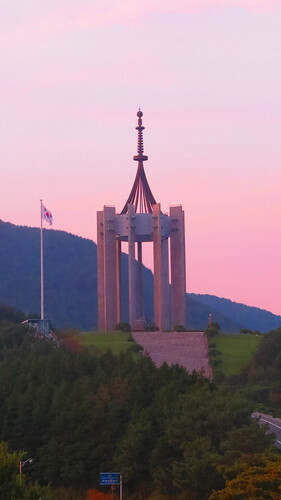 This is a photo I took of Chunghon Tower last September as the sun was setting. Chunghon Tower was built to remind people of everyone who lost their life in the Korean War. It's placement on the hills in the South of Busan is significant because many people had to flee their homes and come to Busan to avoid the North Korean malice, and the mountains around Chungon Tower were the homes of many refugees at that time. Not to mention that once you're at the top, you get a perfect view of Busan, reminding you what they were all fighting for. As soon as 석가탄신일 (Seokga tanshin il), also known as Buddha's birthday, is on the horizon the whole of Korea seems to come alive with lanterns that bob around in the breeze. Buddhism is the most practised religion in Korea and this is a national holiday for most people. 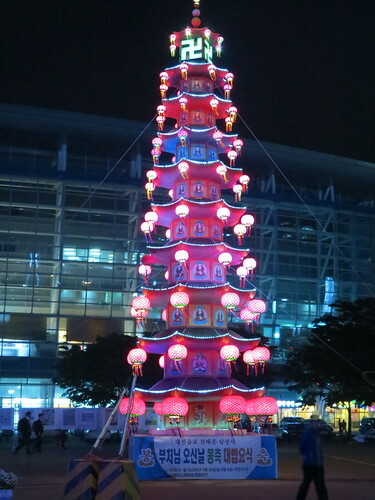 This impressive pink tower is erected outside of Busan Train Station a few weeks before Buddha's birthday. 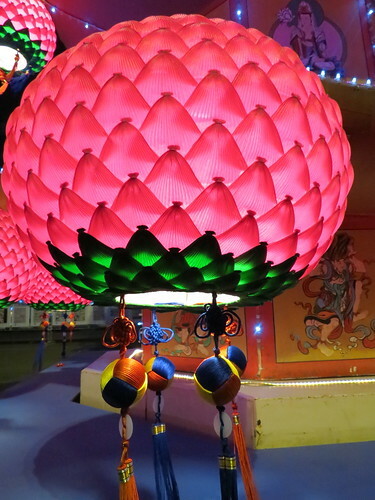 There's something really welcoming about seeing the lanterns, especially when they're glowing at night. They also reminds me that although Korea can seem quite westernised at times, that it still has it's own long standing traditions. 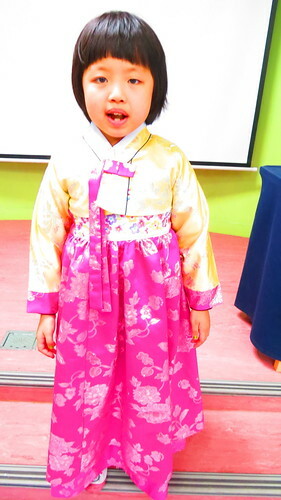 Here is one of my naughtiest students wearing traditional Korean dress called Hanbok. Now-a-days Hanbok is semi-formal, worn for special occasions, or for festivals. The younger kids at school have a special day every few months where they wear their Hanbok and are taught ettiquette. Apparently a pink Hanbok signifies women who are engaged or just married. I think this little lady has a long way to go until she'll be wearing it on her wedding day. It only comes but once a year, and lasts just a week or two at most. It's cherry blossom season, when the pale pink petals bloom on the trees and descend down onto the roads like pink snowflakes or confetti. People cluster to the spots that are lined with these pretty trees. 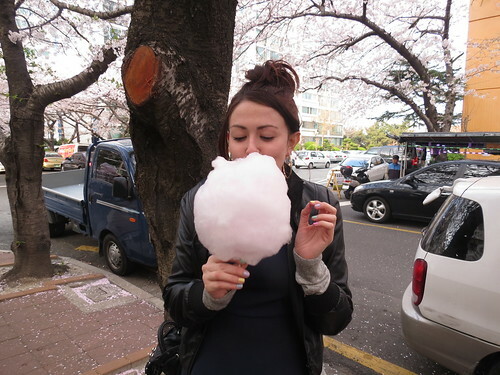 Along the sides of the roads, street vendors sell fluffy pink candy floss and roasted chestnuts, so people can snack while they take photos and make the most of the charm of the delicate flowers until the following year. Themed cafes are very populat in Korea. 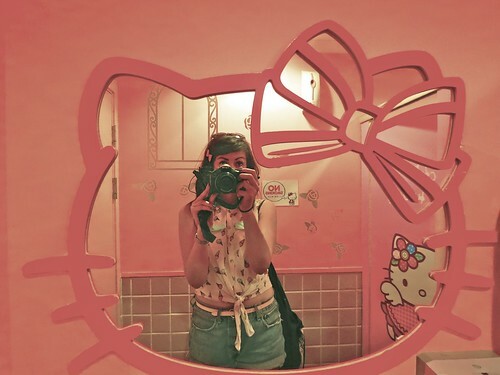 I've been to the Charlie Brown cafe, cat cafes, puppy cafes but the epitome of pinkness has to be the Hello Kitty cafe. Hello Kitty is really popular in Korea (Along with everywhere else in the world) and last year on a trip to Seoul I got to visit the Hello Kitty Cafe to feast my eyes on the pink wonderland that is the mouthless kitten's cafe. 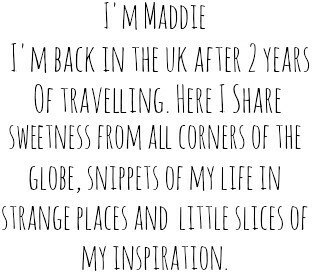 They served amazing cakes and coffees, each one somehow stamped with her personality. I had a pink Hello Kitty shaped mousse and a coffee where her silhouette was sprinkled into the froth. 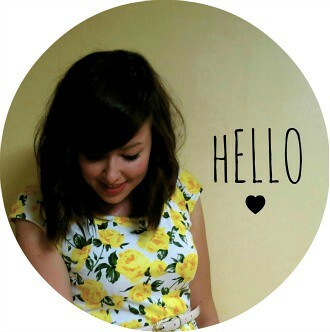 Find out more about the other colours by looking at the links below. Thanks ladies! I think we all did a fantastic job! It was so fun too trying to spot things that weren't a cross over of colours so we could cover as many things as possible!